Welcome to Yorkshire! We recently stayed at the Majestic Hotel in Harrogate. This stately Victorian hotel sits above the pretty spa town, and is currently undergoing extensive renovation to make it better than ever. Not that anything we saw needs it! 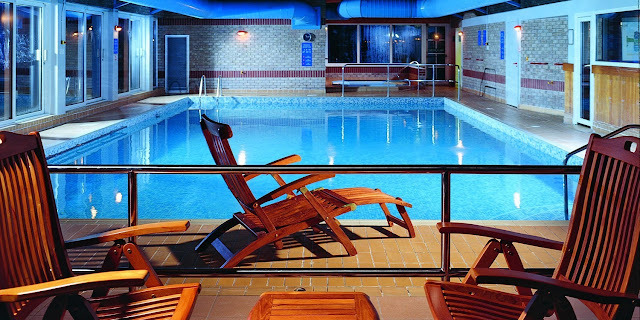 The hotel is immaculate, with comfortably luxurious, lofty rooms and lots of lovely attention to detail. We loved our beautifully decorated Deluxe Garden Room with views across the 12 acres of grounds towards Harrogate. The huge room featured a double bed and large sofa bed, work and seating areas, and a superb deluxe en suite, complete with all the little touches that make a hotel stay more luxurious and relaxing. Complimentary slippers and bath robes make a visit to the swimming pool and spa easier, and who can resist complimentary tea and chocolates! There were lovely touches throughout the room, such as a note from housekeeping beside the bed, complimentary Harrogate spring water, lovely art work and nice toiletries. In the bathroom there was an excellent shower in its own cubicle, but also a shower over the bath to make bathing children easier. Despite being more than a century old, the modern, stylish rooms and bathrooms make The Majestic bang up to date. Opened in the summer of 1900, The Majestic resembled one of the grand railway hotels of the 19th century, but was always designed for luxury. Once frequented by princes from India and Prussia, the hotel also played host to a number of Russian grand duchesses, who no doubt took the spa waters. No wonder our own demi-Russian grand duchesses felt at home! We loved the combination of old glamour and modern style at The Majestic. With slick service to match the modern aesthetic, but plenty of original features and opulent detail, such as Venetian glass chandeliers and spa murals running the length of the Great Lounge, this really is the best of both worlds. The award-winning Majestic Restaurant offers a seasonal menu of English and European-inspired dishes, aiming to make the best of locally-sourced produce. We enjoyed a mozzarella and beetroot salad, mushroom and brie risotto, and an array of delicious desserts, but it would be nice to see more vegetarian or vegan options on the menu. The children's menu was a simple selection but the margherita pizza went down well with our girls, although the highlight of any hotel stay for them is always the breakfast! The Majestic did not disappoint, with a huge array of continental, cold and cooked options. A full four courses were heartily enjoyed! While you are staying at the Majestic Hotel, be sure to enjoy the 12 acres of landscaped gardens, and the swimming pool, which is perfect for children. Both ends are shallow, with a deeper dip in the middle with slopes down, so perfect for early swimmers, and those who would prefer to touch the floor. It's not a huge pool, but there are set swimming times for families, so the kids can be as splashy and noisy as they like and not have to worry about anyone doing lengths. Just be aware that there may be swimming lessons going on at this time too. 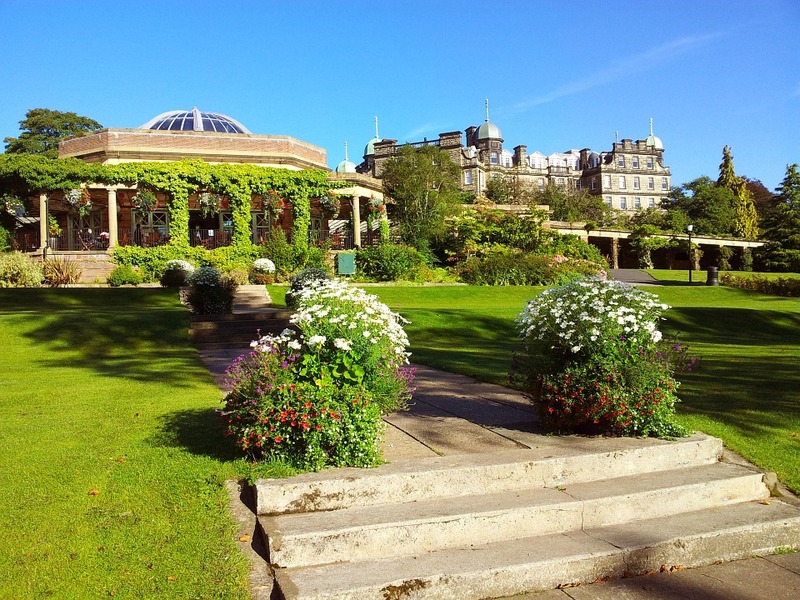 A walk round Harrogate is not to be missed either, taking in the famous Pump Room and the spa for which the town is known. The shops are mostly soft furnishings and ladies fashion, but a rather wonderful toy shop had our girls enraptured, and Bettys Tea Room is a must-see for many. A visit to the lovely Valley Gardens is highly recommended. Just a short walk from the town centre, these Grade II heritage listed gardens feature mineral springs, floral displays and much more. We particularly loved the Japanese Garden and the wonderful children's playground which has assorted large climbing structures, including a wooden aeroplane, lots of swings, slides, and a large paddling pool. Perfect! The adjoining 17 aces of pinewood forest come highly recommended, with adventure trails and much more to discover. Further afield, Leeds with its wonderful art gallery and Henry Moore sculpture centre and York with its amazing history make wonderful days out for kids. We particularly enjoyed the creative space at Leeds City Art Gallery, where the girls got hands on with paper, card and objects after finding inspiration from the modern and traditional art in the gallery. Beautiful Bolton Abbey, the lovely Cow and Calf walk at Ilkley and the Bronte sisters home at Haworth are also fantastic days out with kids. Read more about exploring Haworth with young children and plan a trip! With so much to do and such a great base at the Majestic, we will no doubt be back. A lovely stay, thank you! Book your room at the Majestic Hotel Harrogate online to get the best price, and take a look at their special offers for some wonderful bargains and special treats. Such a lovely hotel, sumptuous but homely, the perfect combination.